No, not Tuxedo, TEXedo. It is a lovely little Dolcetto. Penny Adams has been involved in Texas wine for decades. She began in Horticulture, then Viticulture, and then moved on to winemaking. After becoming the first female winemaker in Texas, she moved to vineyard and winery consulting and has taught courses on the subjects. Penny became the Viticulture Advisor for Agrilife Extension, Texas Hill Country. She brings years of knowledge and experience to Wedding Oak. Mike McHenry had grown grapes for Alamosa Wine Cellars before collaborating to open Wedding Oak Winery. His goal was bigger than making wine; it was to revitalize the town of San Saba. He purchased and renovated three buildings, one of which houses the tasting room. Named for a 400 year old tree under which many have exchanged vows, the winery opened in 2012. To expand their audience, they recently opened a tasting room on 290 at Wildseed Farms. 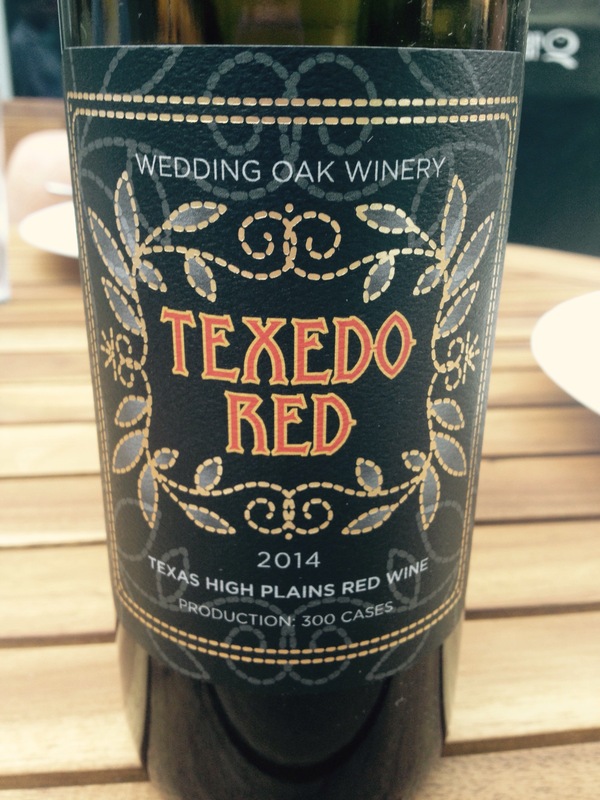 On a recent visit I was able to taste through the line-up of wines from all Texas fruit. There is the aforementioned Bridal Suite. They are also pouring several single grape varieties, a few blends, and next week they will release a series of three wines made especially for the Wildseed Farms Tasting Room. Bridal Blush-Orange Muscat, Muscat Cannelli, and Trebbiano bring soft honey, minerality and floral notes. The Tempranillo brings the blush. Bridal Bliss- Charmant method sparkling of Muscat Cannelli pops with orange honey, refreshingly balanced with acidity. Terre Blanc- A Rhône blend of Roussanne, Marsanne, and Viognier with notes of dried apricot, macadamia nuts, herbs and some tannins. Thanksgiving wine! Baby’s Breath-Riesling dominates; Roussanne, Muscat Cannelli, and the “V” grapes balance out the blend. Baked apples, honey, citrus, minerality. Sweet Alyssum-Muscat Cannelli and Riesling shine in this sweet and floral blend. Winecup- An Italian blend, mostly Montepulciano, in which the fruit and violets shine and leave a soft, warm finish. Wildflowers and wine? Well, that sounds like a match made in heaven. And whether your plan to visit the Hill Country includes nuptials or not, you’re sure to find something to celebrate at Wedding Oak Winery. Cheers! I really enjoy their wines!